Learn from the experts, immerse yourself to the wonderful world of entrepreneurship and business, grab opportunity by the neck! Philippine Business Expo (PBE) gives you the edge. It gives you the exposure and different sets of business opportunities and quality network that you will need to give you the EDGE in starting a business. Besides the EDGE is the bigger horizon that the event will provide you. More than the exposure is a change of mindset and a fresh look at the opportunity present in this time! Get all of these benefits and more! 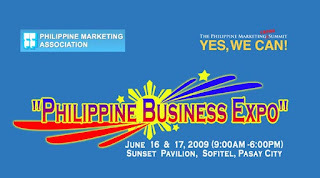 Philippine Business Expo is slated June 16-17,2009 at Mindanao Room, Sofitel Plaza. The best thing about PBE? It's open to the public and there can no other best thing to happen to your time and effort that to rake in all the benefits that this event have for FREE!